Capriccio showing a five-bay rusticated gateway with pedimented central doorway with a niche containing sculpture on either side, and another doorway between semi-engaged columns on either side. Above are attic relief panels on either side of an inscription. Below are details of a six-bay double portico. You are here: CollectionsOnline / Capriccio showing a five-bay rusticated gateway with pedimented central doorway with a niche containing sculpture on either side, and another doorway between semi-engaged columns on either side. Above are attic relief panels on either side of an inscription. Below are details of a six-bay double portico. Capricci showing five plans in pencil, pen and red chalk. The largest is for a pavilion with five-bay apsidal entrance opening to a circular hall with two symmetrical staircases beyond and a rectangular hall on either side. The smaller plan shows staircases and apsidal elevation. Also on the sheet are thre more small and incomplete plans, and detail of a human nose. The large pavilion plan is a version of that in Adam vol.55/173 verso, as are the plan details; the drawing of the nose was probably a discarded life drawing on a sheet that Adam re-used. If this is the case it may well be that the verso drawings were the earlier and that of the gateway elevation on the recto added later. The inscription panel on the sixteenth-century style gateway is lettered 'IMP. R.A. COND/ ANNO COS. XXXII. C', fancifully implying that the scheme was built by the Emperor Robert Adam, who was 32 at the time, thus suggesting a date of 1760 for this drawing and so makes it after Robert Adam's return to England in 1757. It may have been invented during his return north from Rome, perhaps inspired by Sanmicheli's gateways to Verona, especially the Porta Nuova. 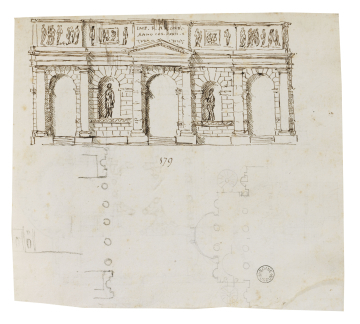 The composition may be contemporary with Adam's pencil view of the complex at the Madonna di Campagna in his copy of Palladio.